Go anywhere, do anything. Feeling at home on groomers and in powder, the ultra-versatile K2 Broadcast isn't afraid to push the limits and duck the ropes to get to the goods. Powered by K2's BAP Core and ICG 10 Carbon Glass atop a Directional Camber Baseline™, the Broadcast is designed to be a stable, energetic, and playful all-mountain do-absolutely-anything snowboard. Go anywhere, do anything. Feeling at home on groomers and in powder, the ultra-versatile K2 Broadcast isn&apos;t afraid to push the limits and duck the ropes to get to the goods. 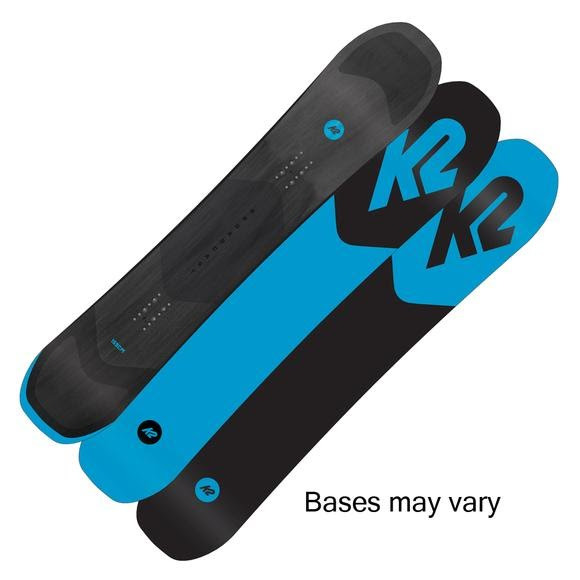 Powered by K2&apos;s BAP Core and ICG 10 Carbon Glass atop a Directional Camber Baseline™, the Broadcast is designed to be a stable, energetic, and playful all-mountain do-absolutely-anything snowboard. The best of both worlds. By blending both traditional Camber and Rocker profiles, Combination Camber gives you all the benefits of both; the pop and precision camber, and the float and predictability of rocker. Available in Direction and Twin Combinations. K2 blended three species of renewable timber to assemble a core that&apos;s strong, lightweight, and designed to enhance dampening without the addition of other materials. Integrating carbon into the fiberglass reducing overall weight and creating a super smooth release of power while increasing pop and liveliness. Each level of ICG is tailored for the rider at hand and their performance needs. K2 Men&apos;s Broadcast (Regular and Wide) Snowboard Size Chart Size (CM) Set Back Waist Width (CM) Weight Range (LB) Side Cut (M) Effective Edge (CM) Tip Width (CM) Tail Width (CM) Stance Width (IN) 156 0.75" Back 24.8 120-200+ 8 119.4 29.2 28.9 22" 159 0.75" Back 25 130-230+ 8.1 121.9 29.6 29.3 22" 158W 0.75" Back 26.6 130-230+ 8.1 121.9 30.9 20.6 22" 163W 0.75" Back 26.6 130-230+ 8.2 124.5 31.3 31 23"